Great Bun Rieu for Real! There is a stereotype of Vietnamese restaurants in Vancouver. They seem to be hole in the walls, where more effort is put into the food than the aesthetics of the place. It’s all well and fine that the food tastes great but often I find myself not really wanting to linger at many of our city’s good Vietnamese restaurants; a classic “eat and get the f*$&# out” scenario for me. However, over the last 2 years I’ve noticed a few Vietnamese eateries buck the trend by having quality food and decor to match. The new Hai Phong is located in the same roundabout as the Chinatown T&T. It is a bright and cheery space, joining the new wave of Vietnamese eateries that strives to serve good food in a pleasant environment. I was lucky to duck out of work for lunch with fellow blogger, Dennis the foodie and his lovely wife, who is part Vietnamese. It’s always a little different when you are in the company of an expert; you get insights and comments on small details that one would otherwise miss. 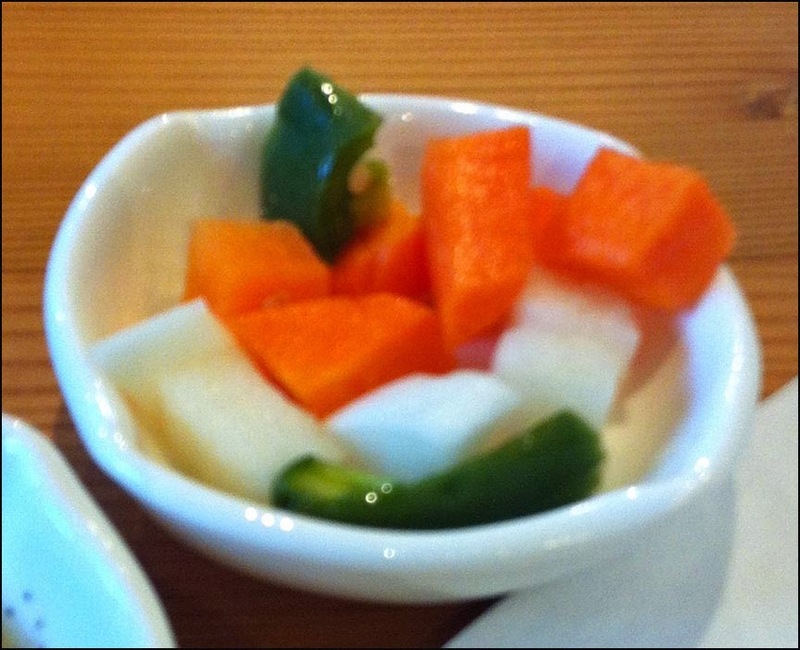 The nicely appointed Hai Phong in Crosstown is a branch of a restaurant of the same name, found on 1246 Kingsway. However this new location has a pared down menu, due to its smaller electric kitchen, in comparison to the mother ship location. Since I needed to head back to work and still be functional, I wanted something light but I simply couldn’t refuse the chicken wings on the menu. As a result, our group shared an order of the Garlic Butter Chicken wings to kick off lunch. 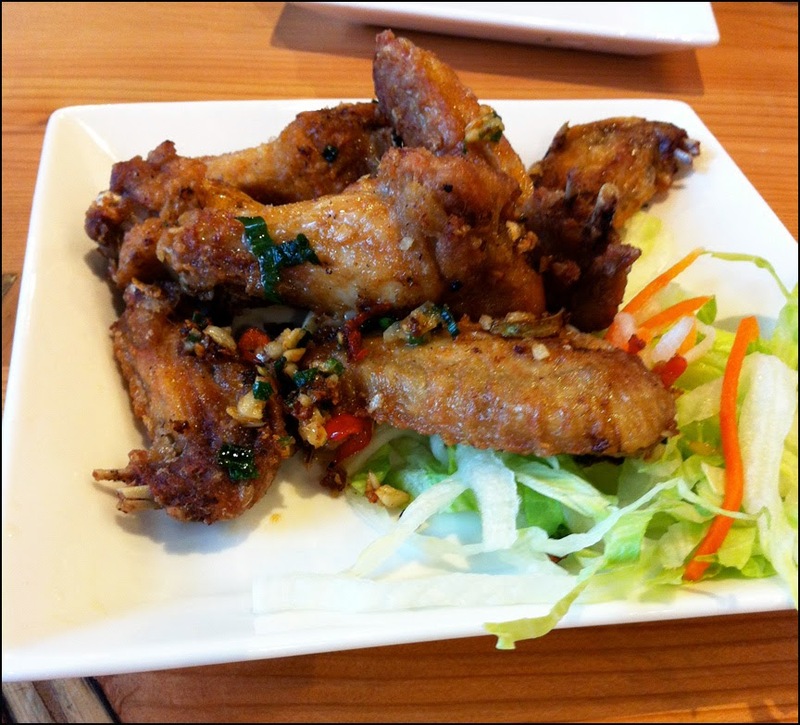 These chicken wings were served with salt & pepper lemon sauce which acted as a nice tart counter balance. The first flavour I detected when chewing the juicy meat from our appetizer was BUTTER. It was followed by a burst of garlic and concluded with a hit of spiciness from the chillies. These well seasoned chicken wings had great flavour and were crispy despite the thin crunchy coating; a potentially addictive must order. Before my lunch guests arrived, I had spotted a noodle I wanted to try but was concerned it would be heavy and induce a food coma. I quickly asked my dining companions if Bun Rieu was light fare even though the menu lists thing like pig’s blood and feet. Apparently it was and it would not hamper my return to the office. I was excited to try this specialty noodle. In addition to the pig’s blood and feet, the shrimp and crab paste noodle soup also includes shrimp and crab paste, Vietnamese ham, tofu puffs and vermicelli noodles. All these ingredients would be steeped in a light tomato shrimp paste broth and served with shredded morning glory and banana flowers. 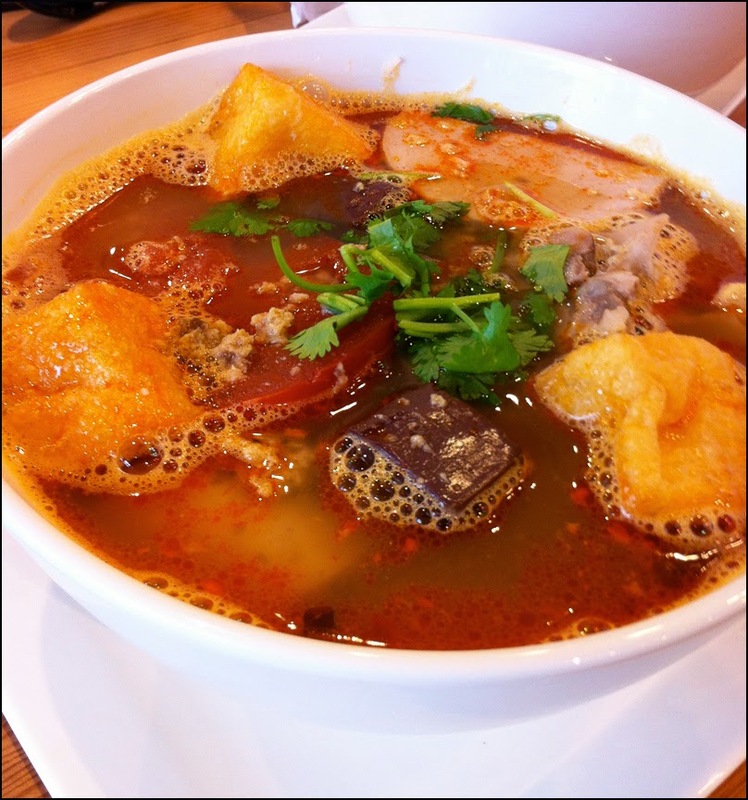 Upon it’s arrival my Bun Rieu emitted an aromatic shrimp paste smell. It was chock full of ingredients. However there was small concession on one of the ingredients. Instead a piece of pig’s feet (complete with bone, tendons, and skin), a chunk of pork with skin (probably pork hock) was used instead. It’s an adjustment that is understandable and wise given the demographics of those living in the tall towers that populate the Crosstown area. My Bun Rieu was appetizing and delicious. The soup was light and complex with a strong umami component from the shrimp paste that paired well with the slightly sour and refreshing tomato flavour. 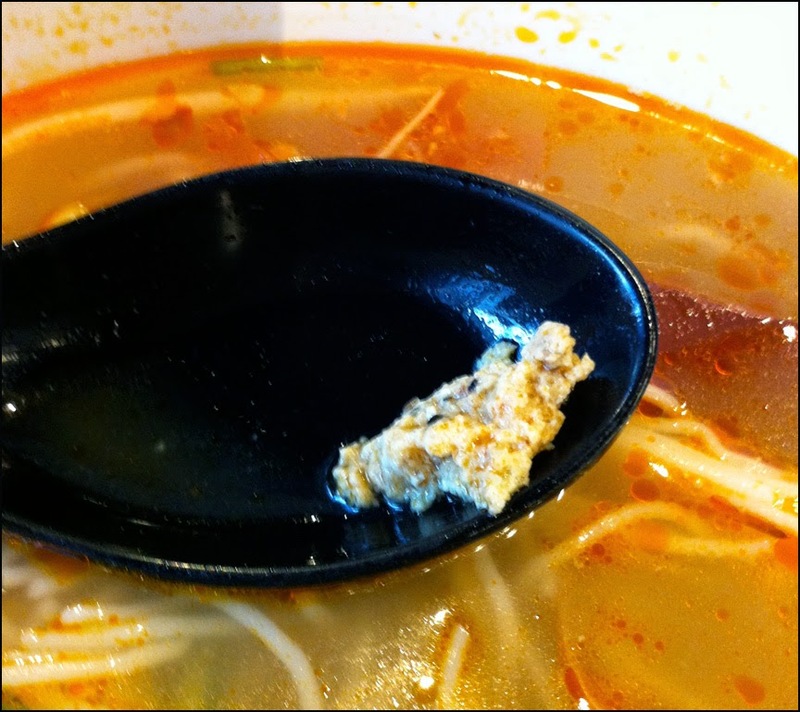 The globs of crab and shrimp paste had a strong concentrated flavour of sweet and savoury dried baby shrimp. As noted by Dennis’s wife, this impactful taste is created by pulverizing dried baby shrimps in a food processor and combining it with crab to form the paste. The presence of the uncommon shredded morning glory (green shreds in foreground) and banana blossoms (beige shreds in the upper left corner), indicates the eateries commitment to traditional Vietnamese fare. 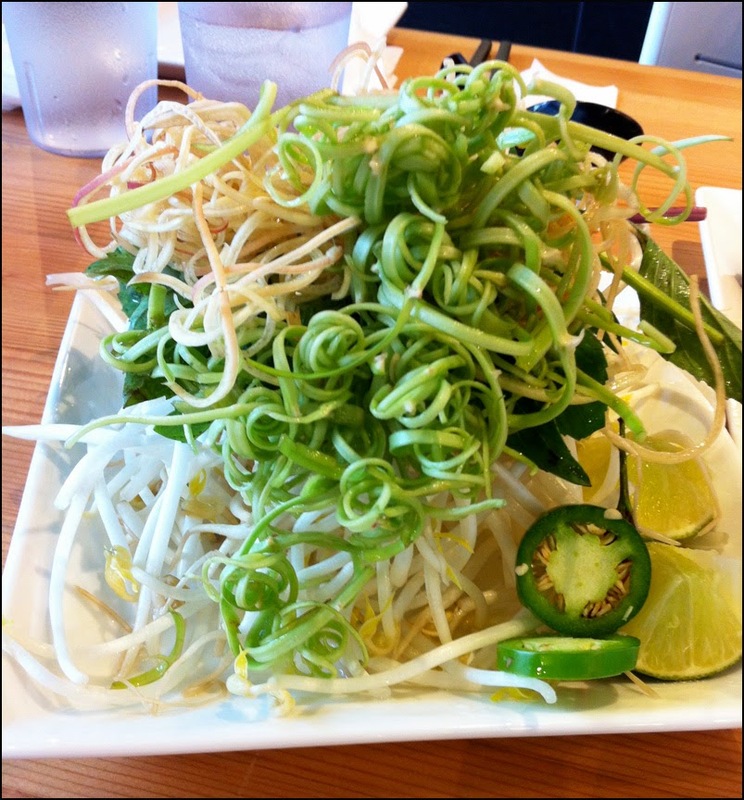 These two plant shreds added an appreciated crunchy contrast to the softer vermicelli noodles. They are to be added to the soup immediately to help them soften up. This helpful tip (see what I mean about being in the company of an expert), provided by my fellow blogger’s significant other, among other astute observations, really made my lunch enjoyable. In short the Bun Rieu is an umami lovers dream; simple, light but full of flavour. In addition, I loved that we were given a complimentary dish of pickles to help cleanse our palates and stimulate our appetites. A nice touch by the staff. The great food at Hai Phong and the equally wonderful dining companions meant my lunch ended up being a two hour affair. I can’t recall if I have ever stayed at a Vietnamese restaurant for more than 75 minutes let alone 120. Hai Phong is a very welcomed addition to the Crosstown area and I will definitely return for a leisurely lunch and their fantastic Bun Rieu.